It's almost 70 degrees in New York City today! It's starting to feel like spring may be just around the corner and boy do I need it. Every year I convince myself that *this will be the year* I skip out on the winter blues . . . but then during the second half of February . . . it hits. Seasonal Depression. Grey Skies. Cabin Fever. Ugh. After a few days of feeling sorry for myself, I've taken action. I went for a long run outside yesterday (my favorite medicine) and I've booked myself a Vitamin IV Drip (yup) at the Nutridrip Flatiron location next week and I'm writing a blog post about it soon. I can just feel I'm deficient in Vitamin D (impacts mood) and Vitamin B (impacts stress & mood). So stay tuned! Anyways! One of my favorite ways to get back on track when I'm feeling off, is to blend up my go-to Green Smoothie. Here's a little two minute video with my friend Alex that shows you how! Sometimes all we need is some greens and fiber to feel better, make our little gut bugs happy and restore our digestive systems. If you've recently come home after a long trip, drank too much wine over the 3-day weekend, or want to ease yourself back in to healthy eating, then this ones for you. This is my go-to recipe all year-round. I recommend adding warming spices like cinnamon or pumpkin spice during the winter months to further help your digestion. In your Nutribullet or Vitamix, blend greens + almond milk first to avoid chunks of spinach. Then add the frozen banana and chocolate protein powder etc., and blend again until you reach your desired consistency. Feel free to add almond butter, avocado chunks, chia seeds, or top with nuts or paleo granola for healthy fat and satiation. Fat is your friend. And just use 1/3 cup of almond milk if you're making a smoothie bowl. And let me know if it tastes a bit like green ice-cream! 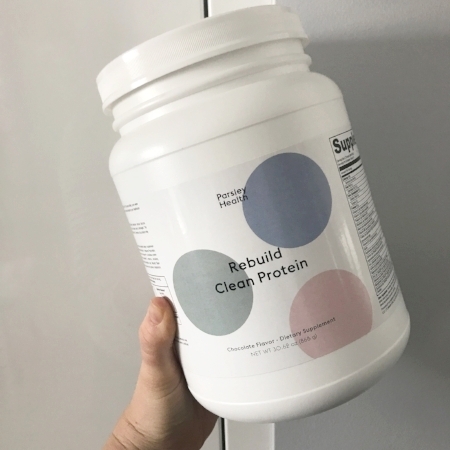 My clients and I swear by this doctor-approved vegan protein powder. Expensive but worth it. Via Parsley Health. I know you're busy. This doesn't have to be hard. Like anything, it will get easier and quicker with practice. Promise. My green smoothie takes me about 3 minutes to make in the morning and I used to whip this one up on the reg when I worked in Finance and commuted daily to Midtown, Manhattan. I live by the motto “freeze yo greens.” Before you think I’m crazy, think about freezing some spinach, peeled ripe bananas and avocado chunks in ziplock bags before you leave for your next business trip. Just like this photo I posted on Instagram. When you come home, all you’ll need is some almond milk and vegan protein powder or almond butter to whip up a rebalancing green smoothie. Store frozen greens and bananas in your freezer, plant-based protein powder, nuts and superfoods in your pantry—you’ll never have an excuse not to be kind and loving to yourself as you sip on some restorative greens. Want more? Read on for Top 10 Reasons Why I Love my Nutribullet, 5 Veggies the Wellness World is Sneaking into their Smoothies in 2017 and some additional smoothie recipes I contributed to Aaptiv's article 7 Cold Weather Smoothie Recipes to Keep You Running All Winter Long.